Go ahead, bring that cookbook into the kitchen. The worn pages of a cookbook have a unique ability to drill into a place where food memory mixes with love and loss. As our kitchen adventures increasingly get recorded in sleek digital files or even the fleeting history of a recipe search, beat-up cookbooks become more valuable, both personally and historically. She had odd little notes — “3 qts water 1 qt vinegar 1 cup salt boil and put on pickles” — and mysteries I have yet to solve, like who was Shirley, why were there quotation marks around her “sugar cookies,” and did they really need a cup of lard? Across the stony heel of Italy, a peninsula ringed by the blue-green waters of the Mediterranean, olive trees have existed for centuries, shaping the landscape and producing some of the nation’s finest olive oils. Except now, many of the trees are dying. Sprinkled among the healthy trees are clusters of sick ones, denuded of leaves and standing like skeletons, their desiccated branches bereft of olives. The trees are succumbing to a bacterial outbreak that is sweeping across one of Italy’s most famous olive regions, as families who have manufactured olive oil for generations now fear ruin, even as officials in the rest of Europe fear a broader outbreak. Emily Green’s helpful summary of California water rights is a must-read. I was going to say it’s a must-read for anyone concerned about the California drought, but really it should be a must-read for anyone living in California. One of the world’s deadliest animals? As in, top-10 deadliest? The freshwater snail, because of its relationship to schistosomiasis, also known as snail fever. The larval form of the parasitic worm that gives the disease its name live in the freshwater snails. The takeaway point of the infographic posted on Bill Gates’ blog was that the mosquito was the deadliest animal because of its role in the transmission of several diseases. The top ten, in order: (1) mosquitos; (2) humans; (3) snakes; (4) dogs; (5) tsetse flies; (6) assassin bugs; (7) freshwater snails; (8) ascaris roundworms; (9) tapeworms; and (10) crocodiles. No other magazine in print would run 2,000 words on the odyssey faced by artisanal bakers who choose to travel with their precious sourdough starters rather than let them perish, first getting the oozing jars through TSA and then feeding them in lonely motel rooms. It asked Anthony Bourdain, pre-Kitchen Confidential, to file something on the opening of Brasserie Les Halles in Tokyo. He turned in a nearly 5,000-word gonzo masterpiece, filled with pre-millennium jet lag and references to things like Apocalypse Now, super-fatty toro, and Krispy Kreme. It put women chefs on the cover decades before Time magazine’s “Gods of Food” debacle, like it was no big thing. It wasn’t, for Food Arts. Interesting to read about another study considering the influence of gut bacteria, this one in connection with glucose intolerance and the potential unexpected effects of consuming non-caloric artificial sweeteners (e.g., saccharin (think Sweet N’Low), aspartame (think Equal), and sucralose (think Splenda). The headline links to the summary in the New York Times; the original article was published in the 17 September 2014 issue of Nature (subscription or article-based fee required). But like the owners of Hobby Lobby, Eden Organics’ owner, Michael Potter, objected to provisions of the Affordable Care Act that addressed birth control coverage by medical insurance plans. Hence Eden’s lawsuit. On its website, Eden Foods talks up its commitment to organic and local farming, social responsibility, and even the LEED green-building standards. “One of our founding principles is sustainability,” says the company’s marketing director, Sue Becker. 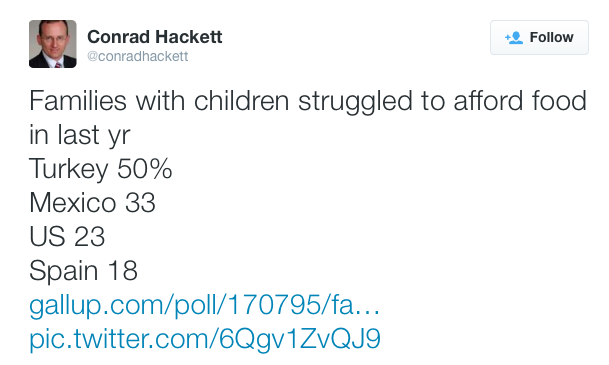 “It guides us today.” But it’s a sad, desiccated version of sustainability that would deny women the ability to decide how many children to have, or whether to have children at all. Shaming, reporting your neighbors, and reprimanding your friends. [F]aced with apparent indifference to stern warnings from state leaders and media alarms, cities across California have encouraged residents to tattle on their neighbors for wasting water — and the residents have responded in droves. Sacramento, for instance, has received more than 6,000 reports of water waste this year, up twentyfold from last year. Some drought-conscious Californians have turned not only to tattling, but also to an age-old strategy to persuade friends and neighbors to cut back: shaming. On Twitter, radio shows and elsewhere, Californians are indulging in such sports as shower-shaming (trying to embarrass a neighbor or relative who takes a leisurely wash), car-wash-shaming and lawn-shaming. Conversations with vendors at the local farmers’ markets always touch on the drought and how it’s affecting them and neighboring farms. Some of the stories are just crushing, so driving home past thick, verdant lawns, or seeing pools of water covering the sidewalk after overwatering grates more and more. 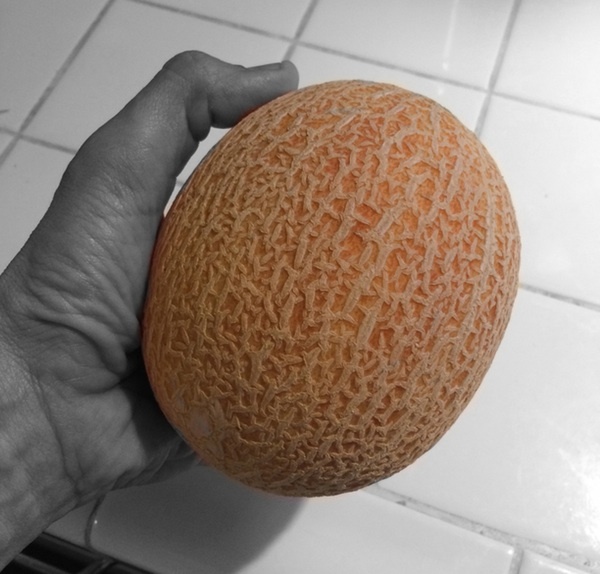 I hold in my hand a small, perfectly ripe Sugar Cube melon from Weiser Family Farms, and that means summer is truly upon us. Because while “indivisible” is certainly hopeful, “founded by farmers” is closer to the truth. Enjoying, on this Fourth of July, a piece by Tom Wolf published last year in Modern Farmer. 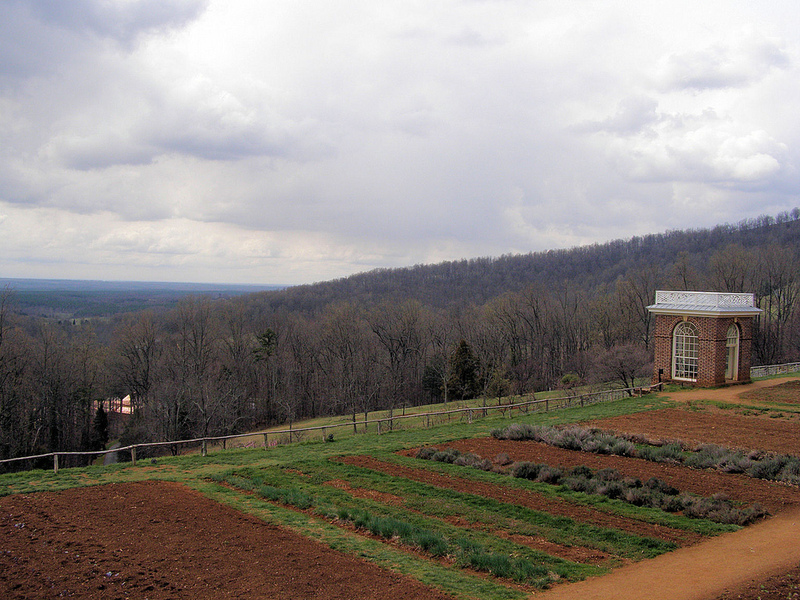 And thinking about a visit to Monticello. Farming can be liberating, satisfying…and terrifying. Diana Marcum’s piece in today’s Los Angeles Times captures the fear during the current drought. 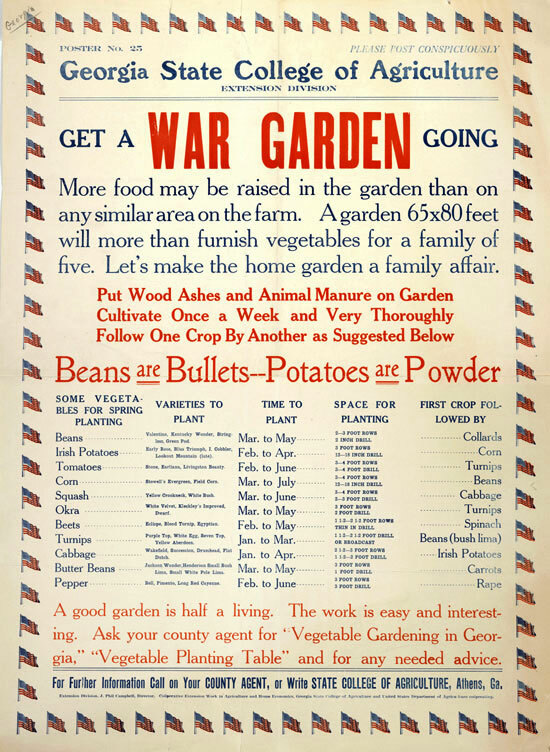 Cory Bernat has compiled an interesting online collection of posters from World War I and II. Some have been reproduced frequently; not surprising when many of the messages are still timely. 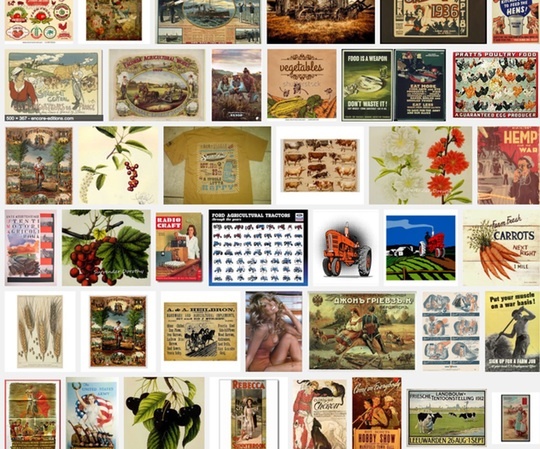 Fascinating, though, that a Google search for vintage agricultural posters yields much that is expected, unexpectedly peppered with thumbnails of Farrah Fawcett posters from the 1970s. Dry farming ≠ farming without rain. By tapping the moisture stored in soil to grow crops, rather than using irrigation or rainfall during the wet season, dry-land farming was a staple of agriculture for millennia in places like the Mediterranean, and much of the American West, before the rise of dams and aquifer pumping. During the rainy season, farmers break up soil then saturated with water. Using a roller, the first few inches of the soil are compacted and later form a dry crust, or dust mulch, that seals in the moisture against evaporation. What matters for the future of healthy food is not just farmers’ markets, CSAs, urban farms, food hubs, and the like—-the particular individual innovations of the foodsheds-—but the ways they interact and overlap. 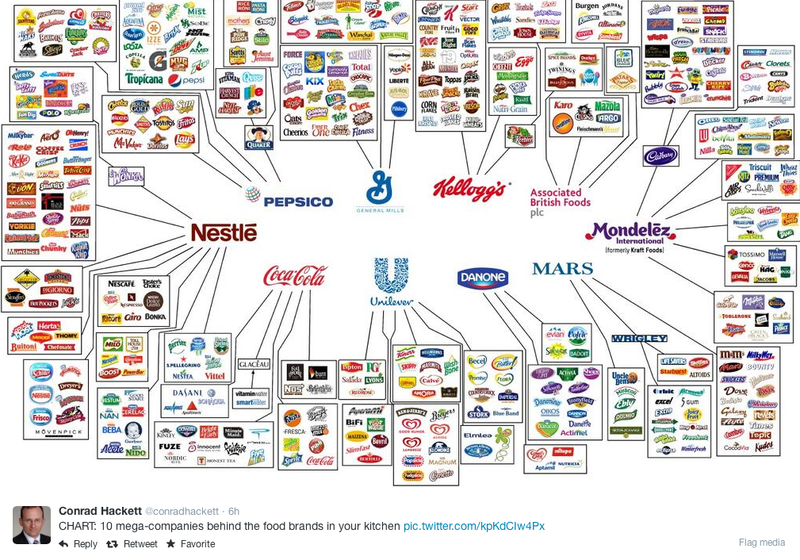 Because it is true: none of the individual features of a local food system are ideal. 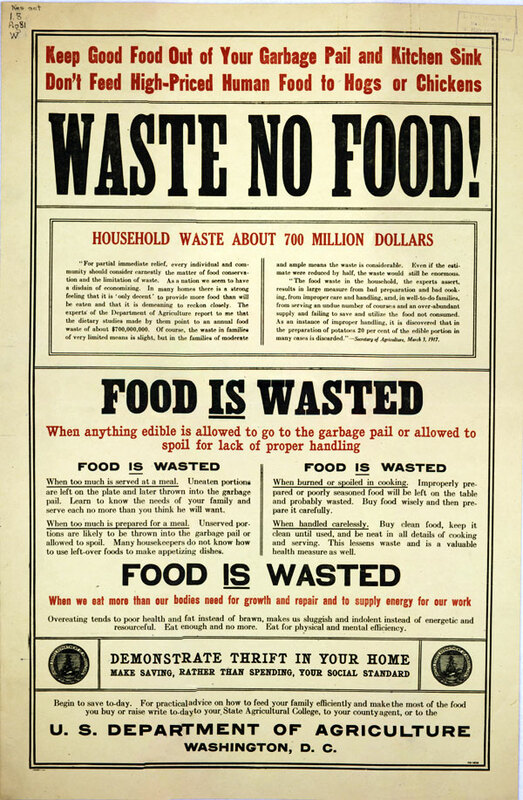 CSAs are not a solution for everyone, nor are urban farms or Whole Foods or farmers’ markets. But the disadvantages of some could be covered by the advantages of others, and in the multitudes come strength. The future of healthy food is not a series of discrete innovations arrayed along a distance-to-proximity axis, that is, but a collective of overlapping cultural and organizational ones. Very important. Plus some excellent suggested reading selections at the end of the essay. N.B., this is the first issue of Gastronomica with its new emphasis and new subtitle: The Journal of Critical Food Studies. SCOTUS on Pom Wonderful LLC v Coca-Cola Co. The decision was announced today; slip opinion available on the Supreme Court’s website. Contrary to some of the headlines this is not a decision about the quality of Coca-Cola’s beverages, but a ruling that one player in a market (in this case, POM Wonderful) may bring a Lanham Act claim against another (e.g., Coca-Cola, one of POM’s competitors in the fruit juice market) because such claims are not preempted by federal law (i.e., a regulation of the FDCA). A six-month investigation has established that large numbers of men bought and sold like animals and held against their will on fishing boats off Thailand are integral to the production of prawns (commonly called shrimp in the US) sold in leading supermarkets around the world, including the top four global retailers: Walmart, Carrefour, Costco and Tesco. The investigation found that the world’s largest prawn farmer, the Thailand-based Charoen Pokphand (CP) Foods, buys fishmeal, which it feeds to its farmed prawns, from some suppliers that own, operate or buy from fishing boats manned with slaves. Men who have managed to escape from boats supplying CP Foods and other companies like it told the Guardian of horrific conditions, including 20-hour shifts, regular beatings, torture and execution-style killings. Some were at sea for years; some were regularly offered methamphetamines to keep them going. Some had seen fellow slaves murdered in front of them. Soylent’s creators have forgotten a basic ingredient found in successful tech products, not to mention in most good foods. That ingredient is delight. Been following Soylent for some time now and it’s hard to decide what aspect of it is most depressing. While that post is in the works, I was somewhat relieved to see this piece, in the New York Times, reflecting so many of the thoughts I’ve had.